Search engines such as Google are very sophisticated. With so many businesses competing to be at the top of the search results, how can you make sure your business stands out? The aim of a search engine is to provide users with the best results for their question or query. This often means providing results based on a particular region or town. Local SEO is the process of optimising web pages so that they appear in the search results when the user is looking for local information or services. An example of a local search query may include the name of a particular town, such as ‘accountant in Bury’ or ‘Italian restaurant Manchester’. Even without using the location in the search term, you can still get localised results. If you operate from a physical location or you cover a particular service area, local SEO is necessary so that new customers can find you. A large proportion of Google searches are location based and many people find the services they are looking for via an online search. The increased use of mobile and searching online on the go means local SEO is vital for any local business. When we talk about local SEO, it’s important to note that we are referring to two different ranking aspects. Organic search results and map ranking. Organic listings are the natural results returned when you type a query into a search engine. Map results are displayed slightly differently as shown by the image below. As well as making sure your business appears in the organic search results, appearing in the map pack is essential. When you search for something with local intent, you will see the map listings near the top of the search results. This map listing contains the top 3 businesses relating to your search, this is known as the map pack or local 3 pack. Which businesses are displayed here is based on both relevance and proximity. Clicking on ‘more places’ will display more results related to the search although appearing in the top 3 is likely to get you more clicks. There is no denying that appearing in the map results can greatly help local businesses get more customers and generate new business. The image below shows the map results when searching for a local term, ‘pizza delivery’. These results will vary based on where you are as map results are proximity based. The second image displays the search result for the same term. The image below shows the top search result for the same term, the map result appears above the organic results. So we know that the aim of local SEO is to help web pages appear in the search results for geo based search queries and we know that local search results can be displayed organically, in the map results or both. So what factors can influence your ranking position? As with any search engine optimisation, on page SEO is extremely important, as are links to the website. Local links or geo relevant links are ideal for local SEO as the links will not only help to boost ranking position but also provide relevant referral traffic. 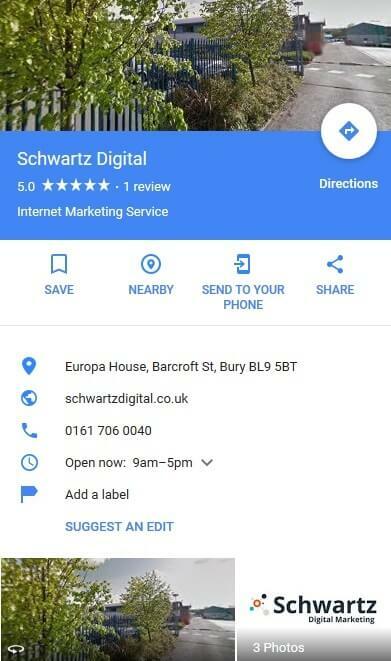 Having a fully optimised Google My Business listing is crucial for local ranking as are NAP citations, reviews and social signals. Make sure your business has a Google business listing if you don’t have one already. Makes sure that you fill out all the fields accurately, choose the most relevant categories and remember to add some photos relating to your business. 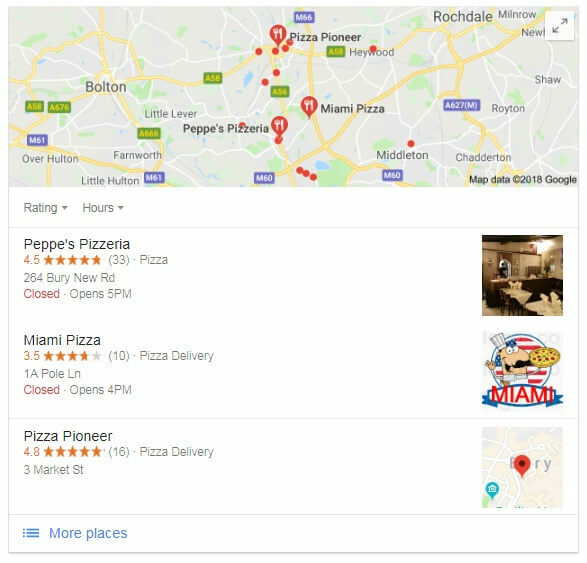 Your google business listing is displayed in the map results whenever anyone clicks on your business as well as in the search results, usually when searching for the business name. The listing displays your business name, contact info, opening hours, photos and reviews. It also displays a link to your website along with the option to get driving directions to the business. On Page SEO is crucial as it helps search engines to crawl your site and understand the content of your pages. Site structure, optimising page titles, meta descriptions, URLs, headings and image ALT text are all necessary to fully optimise your pages. Adding local schema can also help add local relevance to your site. A NAP citation is simply a mention of your business name, address and phone number. Business directories such as Yell and Yelp are ideal for building citations, you can create your businesses listings and add your business details along with your web link. It is important to make sure that this information is consistent and that your business name, address and phone number is written exactly as it is on your GMB listing. Links are still one of the most important ranking factors. 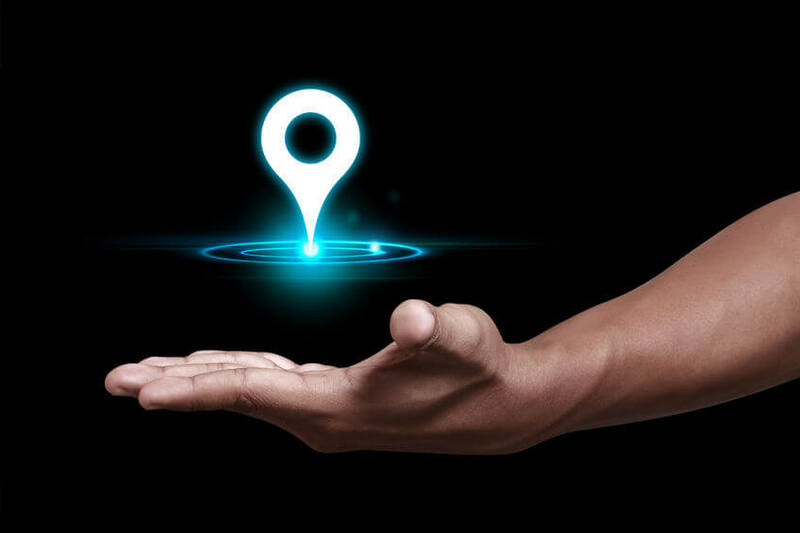 For local SEO, building geographically relevant links can not only give you a boost in the search results but also sent relevant traffic to your site. It is often considered that reviews have a positive affect on ranking. Encouraging customers to leave a review via google my business is a good idea as it not only builds trust, it can also help boost map ranking.